"I will start my operations here and pull the Rebels apart, piece by piece. They will be the architects of their own destruction." The struggle against the Empire is just beginning. Throughout the galaxy, resistance groups have begun to join together into a Rebel Alliance. The Outer Rim planet of Lothal is under the watchful eyes of Grand Admiral Thrawn, who monitors the planet for Rebel activity, looking to crush it beneath the Empire's heel. The Lothal Resistance has arisen to fight back against this tyrannical oppression, and now it's your turn to answer the call! 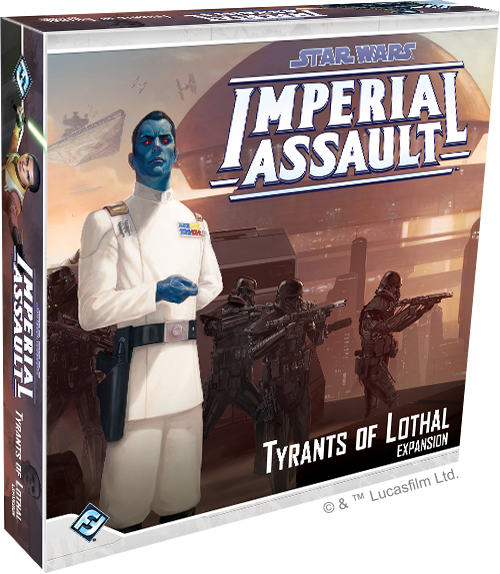 Fantasy Flight Games is proud to announce Tyrants of Lothal, a new expansion for Imperial Assault, available for pre-order now from your local retailer! Tyrants of Lothal is not releasing alone either, so be sure to also pre-order the Ezra Bridger and Kanan Jarrus Ally Pack, the Sabine Wren and Zeb Orrelios Ally Pack, the Thrawn Villain Pack, and the Hondo Ohnaka Villain Pack to upgrade your Imperial Assault experience! You can find out more information about these additional figure packs here. Tyrants of Lothal introduces new heroes, enemies, allies, map tiles and a six-part mini-campaign for Imperial Assault, the strategy game of epic missions and thrilling combat. These components bring the planet of Lothal to life and give you the oppurtunity to join the burgeoning Rebel Alliance. Whether it's in a campaign or skirmish game, the fate of the Rebellion rests on your shoulders… but you're not alone. Join the crew of the Ghost from Star Wars Rebels in your epic fight against Grand Admiral Thrawn, your dealings with the shifty pirate Hondo Ohnaka, and your mission to take down the tyrants of Lothal! Inspired by a transmission from young Rebel Ezra Bridger, heroes on the planet of Lothal have decided to stand up against the Empire and spark their own rebellion. But will they have what it takes to stand up to the might of Grand Admiral Thrawn? 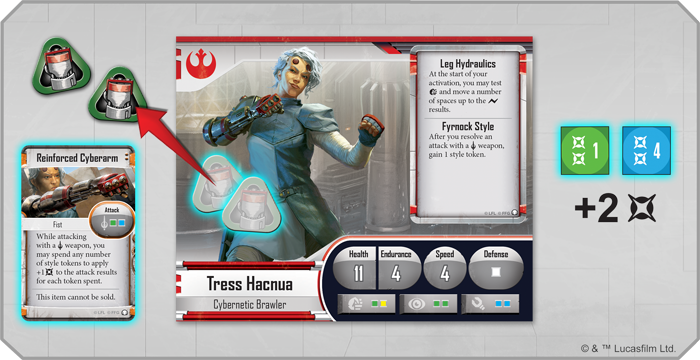 Tyrants of Lothal gives you the opportunity to play as two new heroes from the Star Wars galaxy, including Tress Hacnua, a Cybernetic Brawler who brings a unique style to the combat of Imperial Assault. Tress begins the game with a fairly average speed of four, but that can be buffed by testing strength at the start of her activation and moving a number of spaces equal to the surges you roll. These Leg Hydraulics give Tress upgraded mobility, but her unique combat prowess really shines through her Fyrnock Style combat. Whenever you resolve an attack with a melee weapon, you gain a style token! 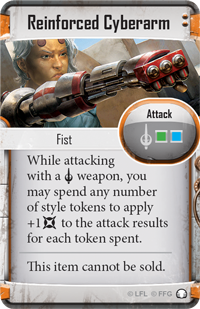 Tress’s starting weapon, the Reinforced Cyberarm, is the perfect way to start spending these style tokens. Whenever you attack with a melee weapon, the Reinforced Cyberarm lets you spend any number of your style tokens to increase your damage for each token spent. When playing as Tress, you can always augment your melee attacks with style tokens, or save up two of them for a massive attack on a difficult foe. Tress’s other upgrades also revolve around her style tokens. 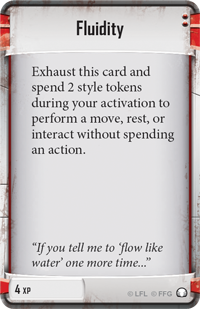 If you manage to save up four XP during a campaign, you can purchase Fluidity to give Tress even more options—you can exhaust Fluidity and spend two style tokens to perform a move, rest, or interact without spending an action. Tress can become extremely efficient during your turn, taking down enemies and making her way to mission objectives in half the time that it would take to do so normally. 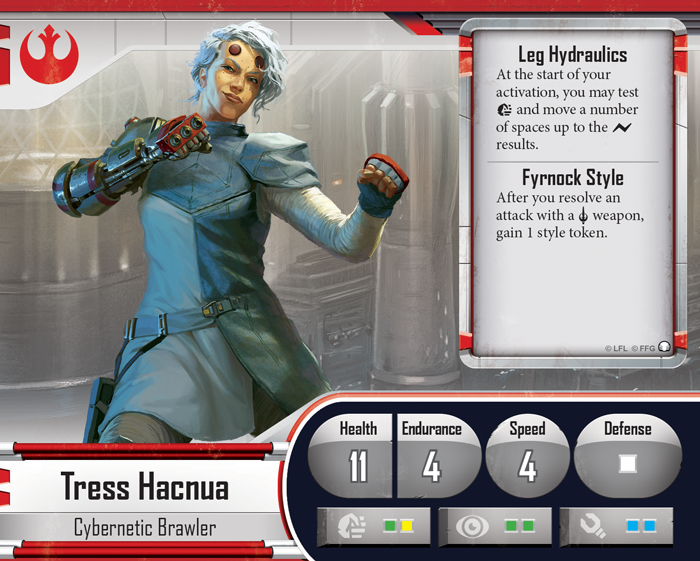 By spending two style tokens, Tress adds two damage to her melee attack with the Reinforced Cyberarm! After the attack resolves, she will gain one token back thanks to her Frynock Style ability. Tress will need all the help she can get with the enemies found in Tyrants of Lothal. Far more deadly than an Imperial Stormtrooper, Death Troopers are an elite group of soldiers specialized in guarding high-ranking Imperial officers. Now, they enter Imperial Assault as a well-trained force for the Imperial player. 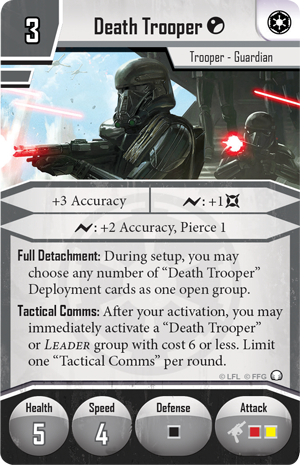 Not only do the Death Troopers roll a red and yellow attack die with deadly accuracy, but they can organize to allow the Imperial player to activate multiple Death Troopers in a single turn. Their coordination starts during setup when you can choose any number of Death Trooper deployment cards as one open group. Furthermore, after a Death Trooper activates, you can activate another Death Trooper or a Leader group that costs six or less, allowing you to use multiple groups before the Rebel players can activate. Death Troopers work best by fighting in unison, and with surges giving them extra accuracy and Pierce 1, they are sure to hit their target with amazing speed and efficiency. If you're fielding the elite version of a Death Trooper as part of your open group, you'll also gain the advantages of the Squad Captain ability, granting an adjacent Trooper or Leader character a power token of your choice to give Imperial forces an edge in combat. These power tokens were first introduced in Heart of the Empire, and they make their return here to boost your allies on the battlefield. 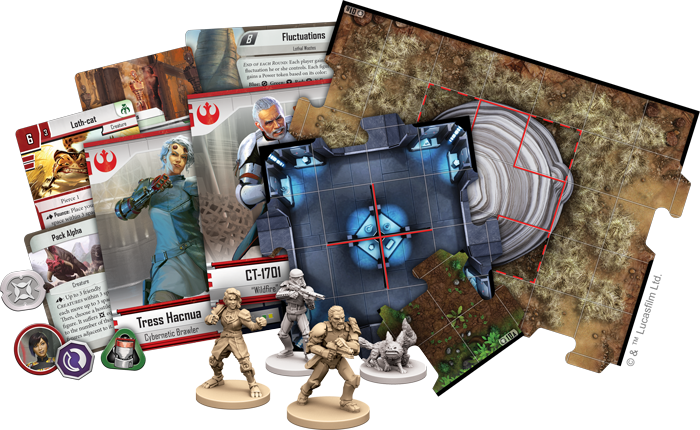 Tyrants of Lothal presents several new ways to play the Imperial Assault campaign game, with six missions that can either be incorporated into any full campaign or played in sequence as the Tyrants of Lothal mini-campaign. Join the crew of the Ghost on a galaxy-spanning adventure, and team up with Ezra Bridger, Sabine Wren, and more familiar faces to outwit the Empire and bring freedom to the galaxy. But you have to start somewhere, and thanks to the unlikely assistance of the pirate Hondo Ohnaka, your burgeoning heroes have learned the location of an Imperial arms shipment, ripe for extraction. It is now or never—time to step out of the shadows and join the Rebel Alliance! Furthermore, Tyrants of Lothal includes two new skirmish missions for use on the Lothal Wastes map built from new tiles featured in the box. Skirmish versions of the new heroes promise to shake up up the format, and new command cards give you even more customization options. Tress Hacnua is an offensive powerhouse in campaigns, and she brings this same vigor for combat to skirmishes. 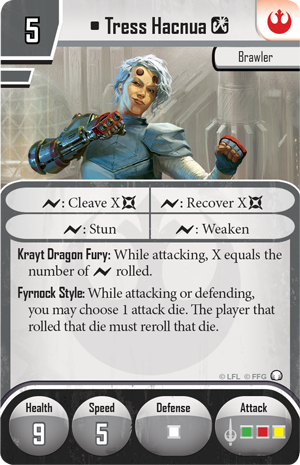 While she loses her style tokens she gains a massive advantage with her Krayt Dragon Fury, which allows her to gain massive bonuses based on the number of surges rolled during an attack. This includes a powerful Cleave ability which can be further augmented with the Spinning Kick command card! 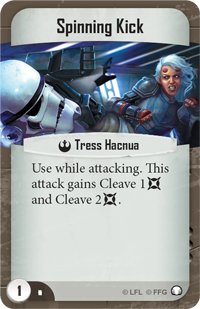 Add some style to your Imperial Assault skirmishes with Tress Hacnua and the rest of the Tyrants of Lothal figures!